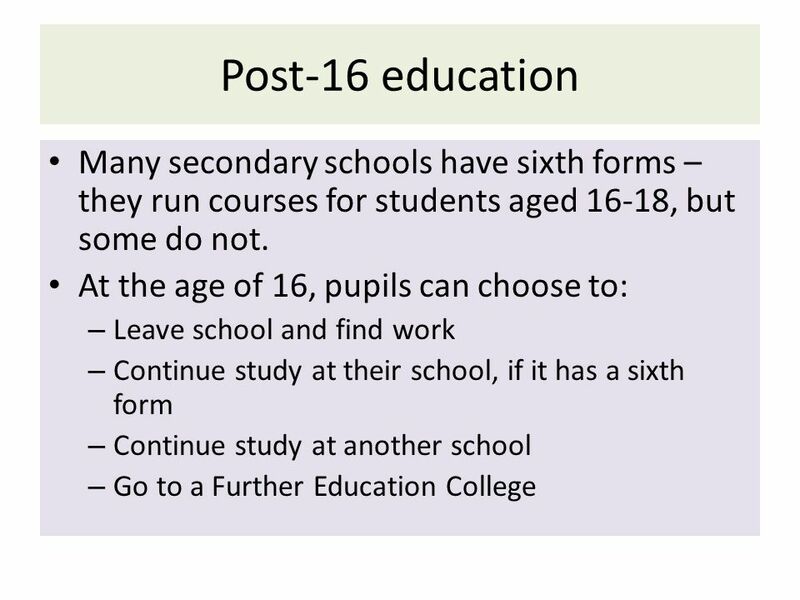 4 From 2013, the school leaving age will be 18, not 16. 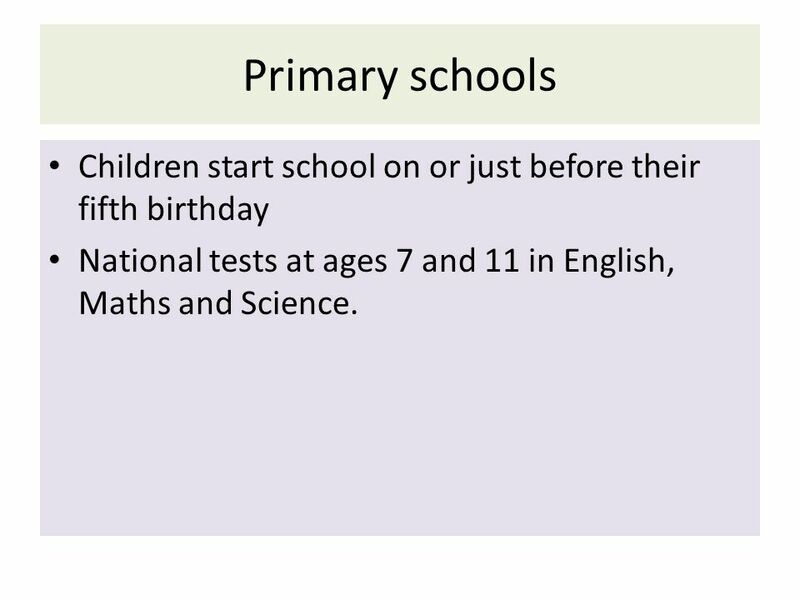 5 Primary schools Children start school on or just before their fifth birthday National tests at ages 7 and 11 in English, Maths and Science. 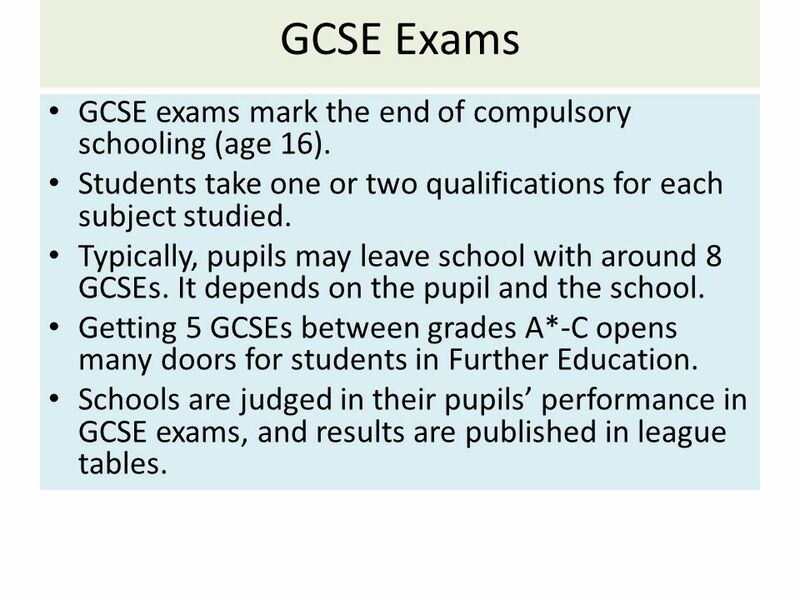 7 GCSE Exams GCSE exams mark the end of compulsory schooling (age 16). 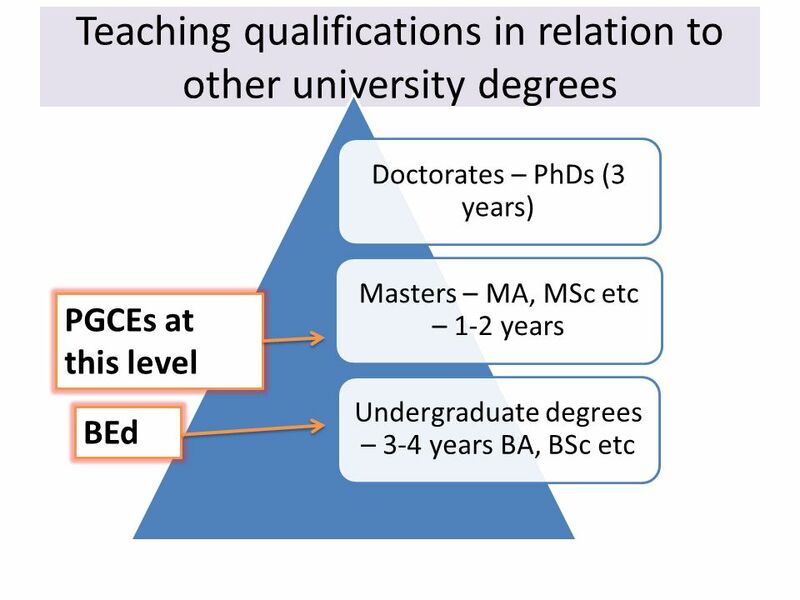 Students take one or two qualifications for each subject studied. Typically, pupils may leave school with around 8 GCSEs. It depends on the pupil and the school. Getting 5 GCSEs between grades A*-C opens many doors for students in Further Education. Schools are judged in their pupils’ performance in GCSE exams, and results are published in league tables. Students must have achieved 5 A*-C grades at GCSEs. They should achieve a B or above in the subjects they want to study. 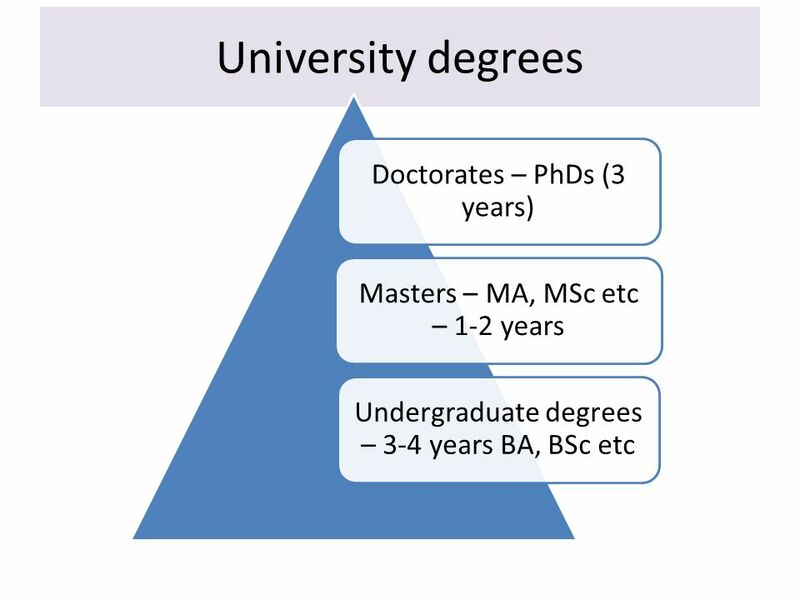 Usually, students take 4 subjects in the first year, and 3 in the second year. 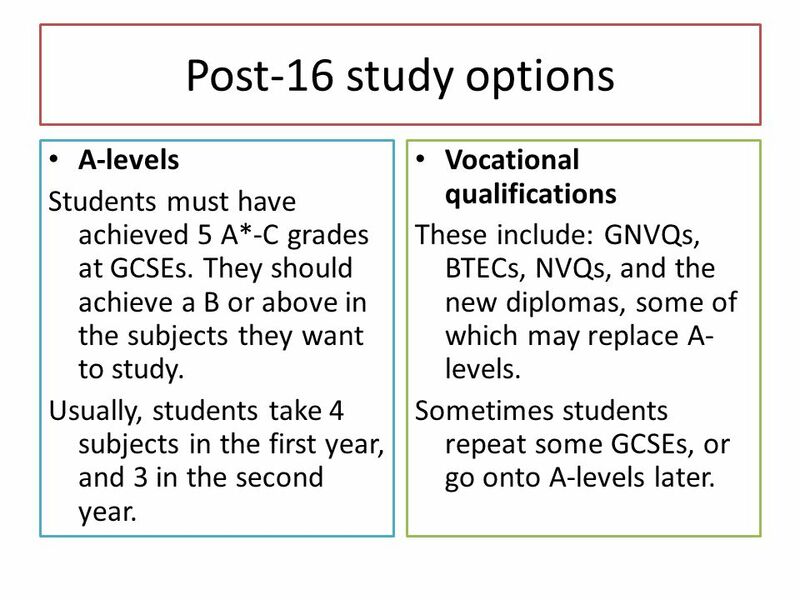 Vocational qualifications These include: GNVQs, BTECs, NVQs, and the new diplomas, some of which may replace A-levels. Sometimes students repeat some GCSEs, or go onto A-levels later. 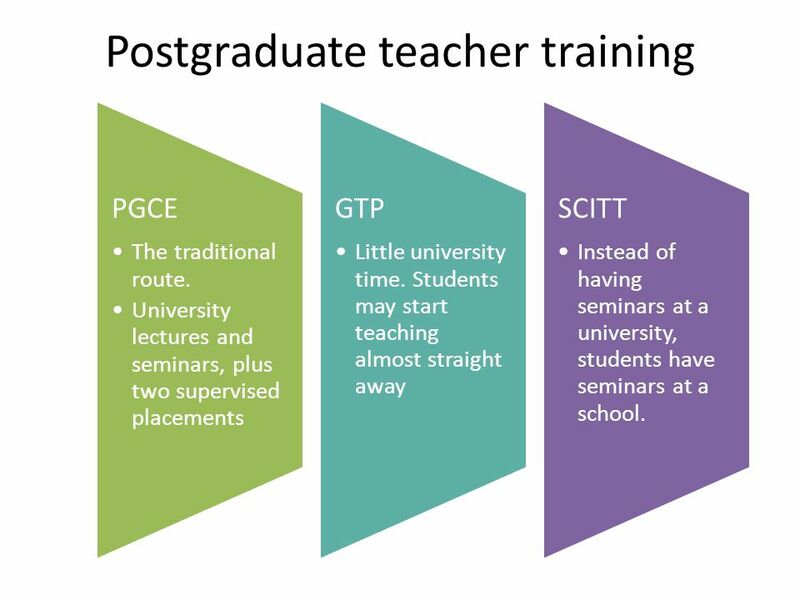 PGCE The traditional route. University lectures and seminars, plus two supervised placements GTP Little university time. 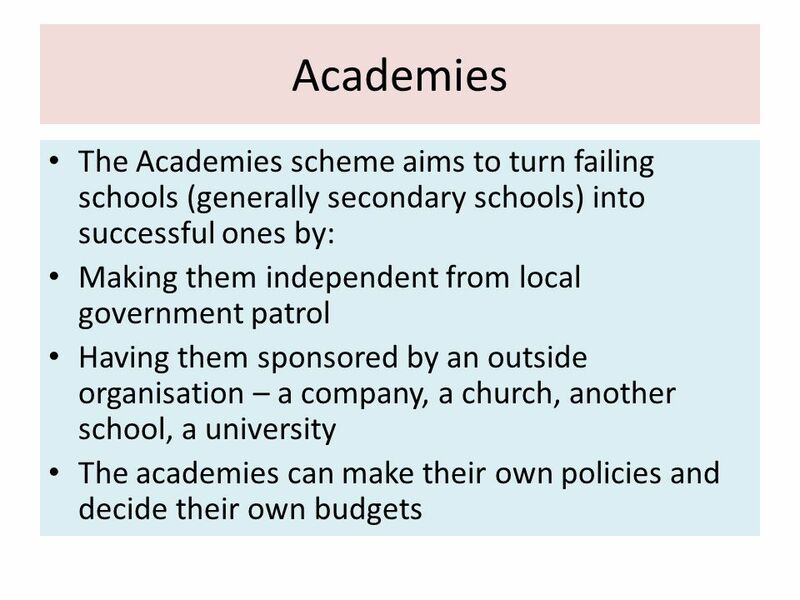 Students may start teaching almost straight away SCITT Instead of having seminars at a university, students have seminars at a school. 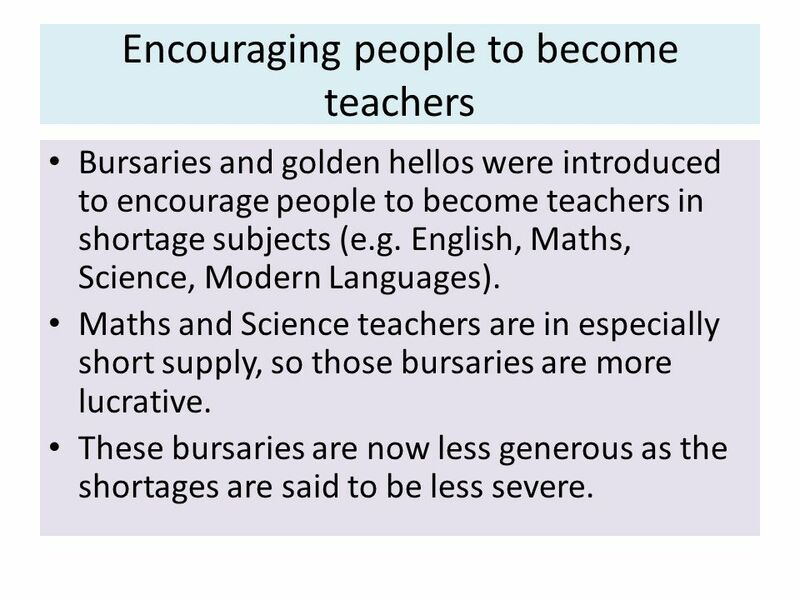 Bursaries and golden hellos were introduced to encourage people to become teachers in shortage subjects (e.g. English, Maths, Science, Modern Languages). Maths and Science teachers are in especially short supply, so those bursaries are more lucrative. These bursaries are now less generous as the shortages are said to be less severe. 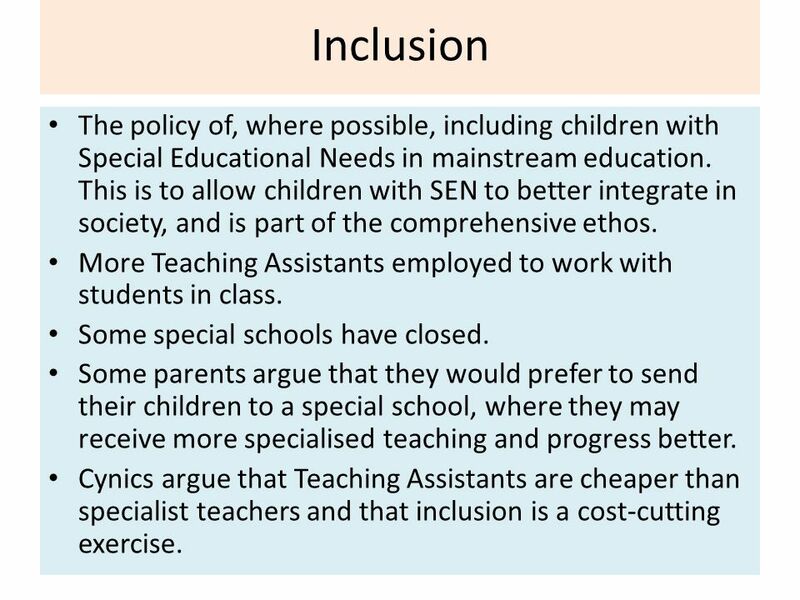 16 Inclusion The policy of, where possible, including children with Special Educational Needs in mainstream education. This is to allow children with SEN to better integrate in society, and is part of the comprehensive ethos. More Teaching Assistants employed to work with students in class. Some special schools have closed. 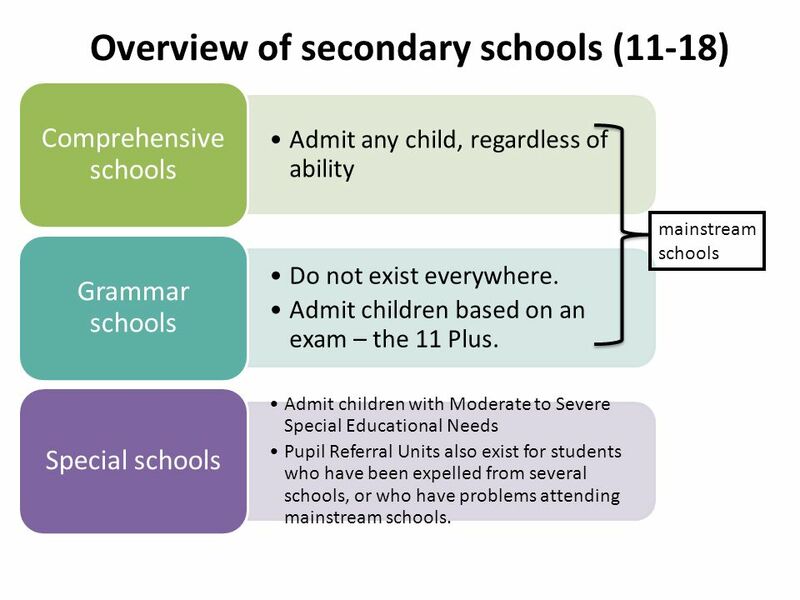 Some parents argue that they would prefer to send their children to a special school, where they may receive more specialised teaching and progress better. Cynics argue that Teaching Assistants are cheaper than specialist teachers and that inclusion is a cost-cutting exercise. 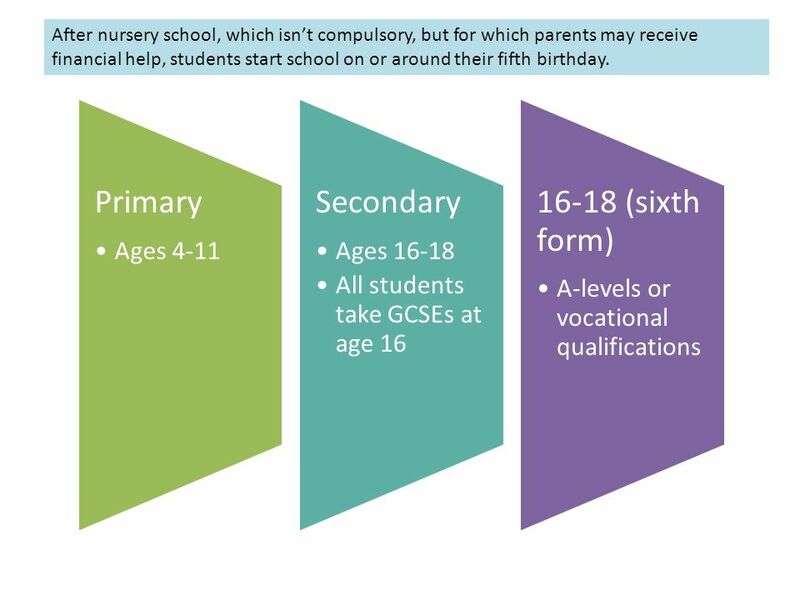 17 GCSE Achievement Schools are increasingly judged on how many of their students achieve 5 GCSEs graded A*-C (“good” passes) at age 16, the end of compulsory education. Results are published every year, and league tables are also produced, so parents can see how local schools perform. 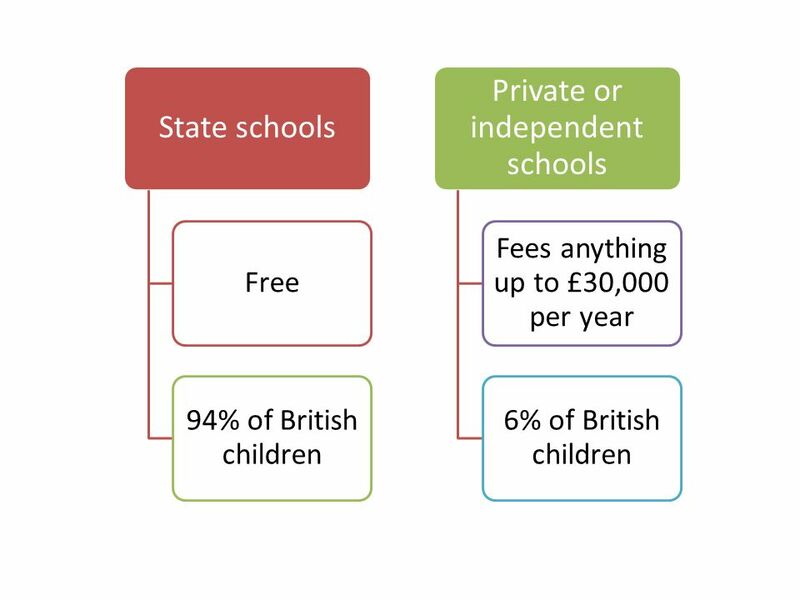 Lower exam results may mean that schools become less popular, and therefore lose their prestige, and extra funding (e.g. for being a specialist school, which only high-achieving schools can be). 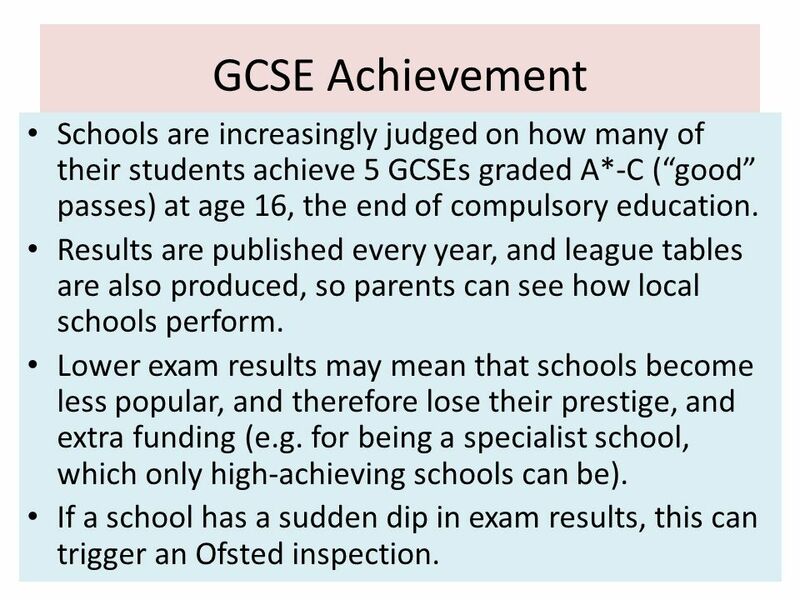 If a school has a sudden dip in exam results, this can trigger an Ofsted inspection. 18 Why is this controversial? Some schools have been accused of manipulating their figures by entering students for ‘easier’ subjects, or not entering them for the exam if they are unlikely to get a ‘C’ grade. Schools are now judged on how many of their students get 5A*-C grades in subjects including English and Maths, which can mean more emphasis on these subjects. 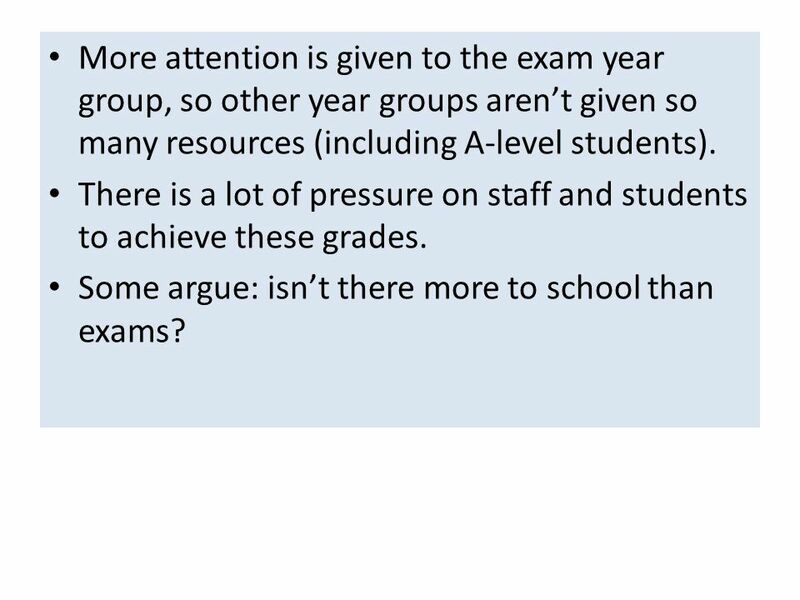 19 More attention is given to the exam year group, so other year groups aren’t given so many resources (including A-level students). There is a lot of pressure on staff and students to achieve these grades. Some argue: isn’t there more to school than exams? 21 Diplomas Diplomas started in They are designed to replace GCSEs and A-levels and are more practical and applied. 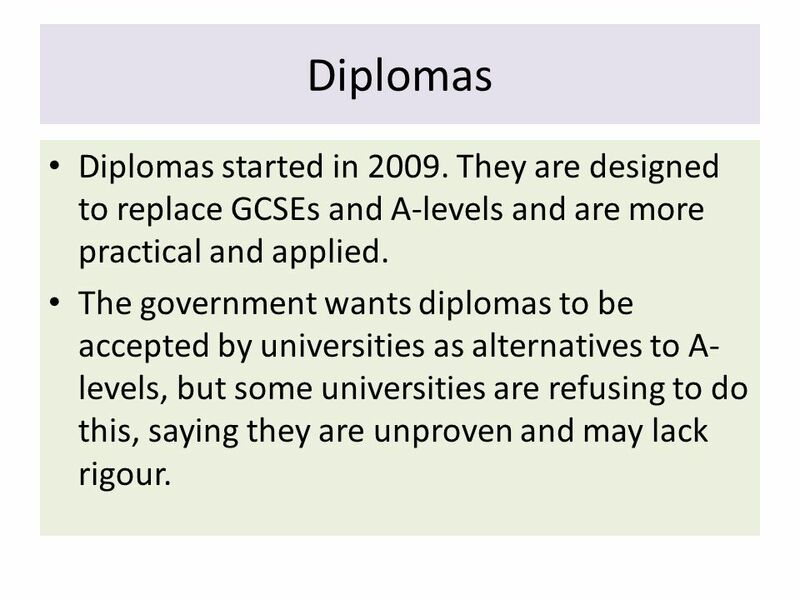 The government wants diplomas to be accepted by universities as alternatives to A-levels, but some universities are refusing to do this, saying they are unproven and may lack rigour. 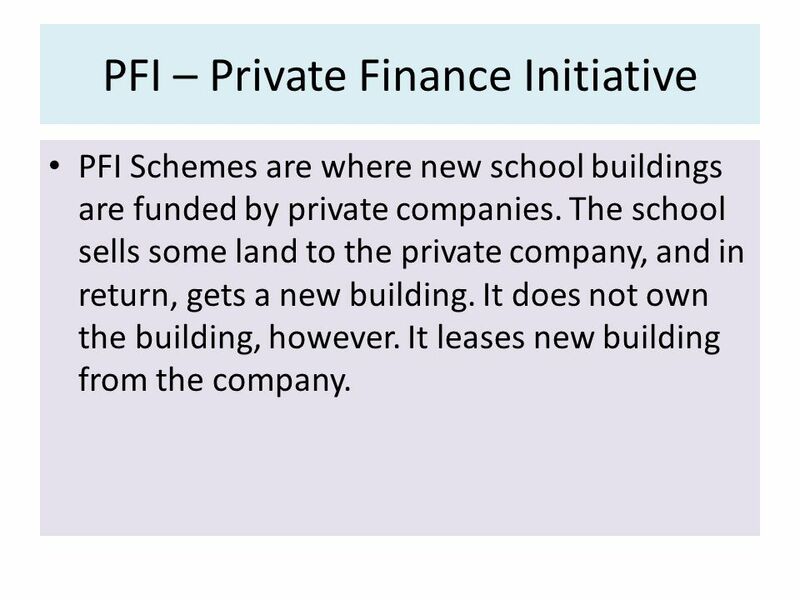 PFI Schemes are where new school buildings are funded by private companies. The school sells some land to the private company, and in return, gets a new building. It does not own the building, however. It leases new building from the company. 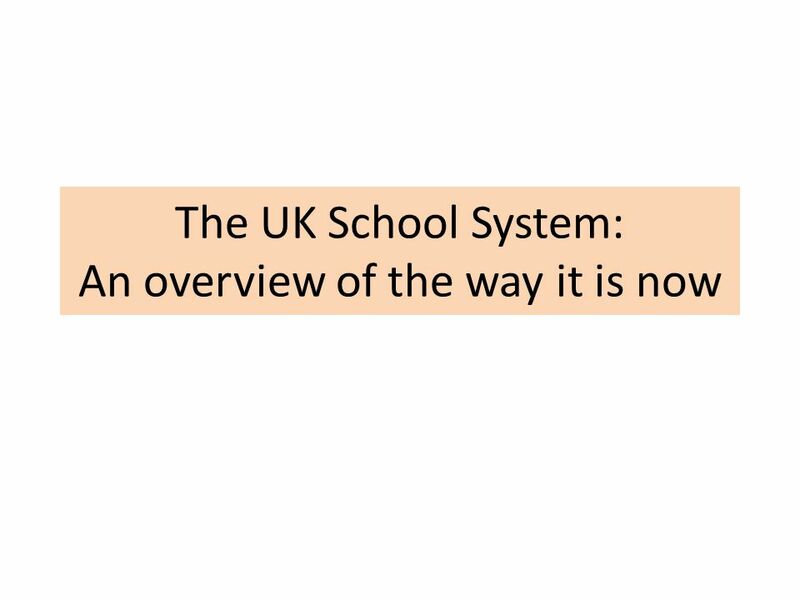 Download ppt "The UK School System: An overview of the way it is now"
How to become a Qualified Teacher? By Shahid Hussain. Guess the Teaching acronyms! 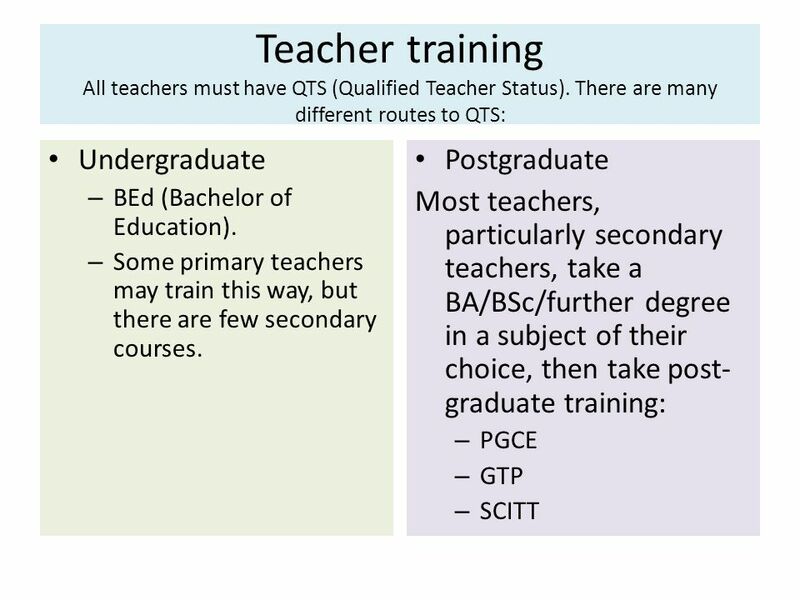 GTP PGCE EBITT QTS SCITT AfL BfL IT SST GST INSET L.O. THE CHANGING FACE OF EDUCATION School-Based Professional Studies Programme Spring Term SCHOOL OF SOCIAL SCIENCES AND INTERNATIONAL STUDIES GRADUATE SCHOOL. 1 THE ROMANIAN EDUCATION SYSTEM. 2 Reforms, after the fall of communism, in the Romanian education system focused on adapting education to the changing. Comprehensive school Basic education Ages Matriculation Examination Upper secondary school Vocational Qualifications Vocational schools and Apprenticeship. University of Surrey Issues in Politics Today Education, Education, Education? Points for discussion arising from the Conservative, Labour and Liberal. On entry playground noise played into the room. The Study Programme Guide for ITE students The Study Programme Guide for ITE students “The aim of Study Programmes is to maximise the potential. WARM UP  Write a short response to the following questions: 1. 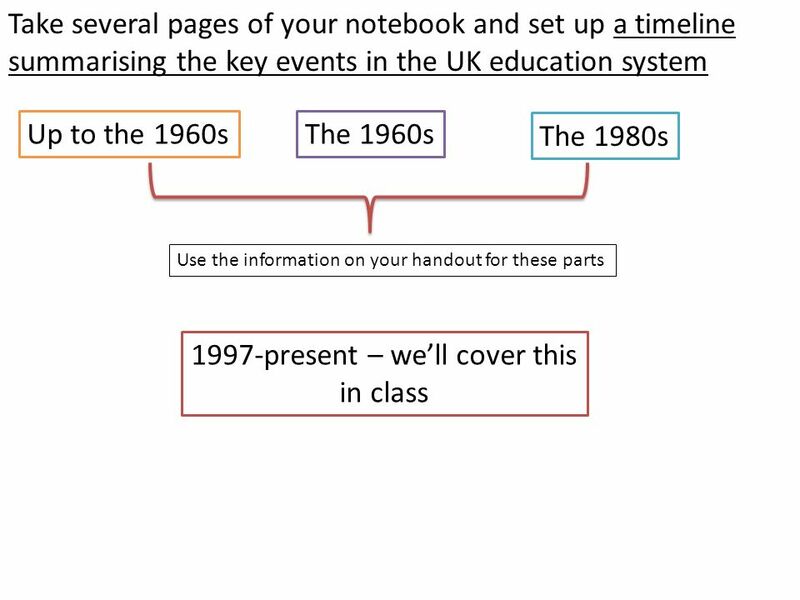 What are the most important elements of taking notes in class? 2. What do we need to know. 11/05/07Judith McGovern Physics in UK Education1 Physics in UK Education Judith McGovern University of Manchester. English and Welsh Education System Presented by Sharon Ghiacy, Icknield School.